If you have been looking for a Link Pyramider review and how it matches up to SEnuke, read on. There are one too many ways to climb SERPs. With the changing search engine algorithms and rules, it is best to have many weapons in your arsenal. Link Pyramider offers yet another way to be on the first page of Google by using content pyramids. This backlinking tool is web-based so you don’t have to download anything except for the AccountBot that comes with LinkPyramider. It has a very simple user interface and everything you need to know to use the service is accessible on the sidebar. Doyle Lewis is the creator of Link Pyramider. If you’re a regular at the SEnuke X forum, you know him as keliix06 too. Without a doubt, he knows Senuke X- this makes him all the more qualified to develop a tool that will complement the already powerful backlinking service from Areeb Bajwa. According to his website, Doyle is a huge fan of pyramids that’s why he created Link Pyramider. He has a hands-on experience and success with link pyramids. Many marketers know about link pyramids and its effectiveness. Many SEnuke X templates would attest to that (think: Single Level Pyramid, The Link Pyramid, etc.). But why do link pyramids work? To fully enjoy the benefits of a link pyramid, it needs to be done with utmost care. There could be as many levels as you want in a pyramid. Each level is composed of sites that has different posts on it. Each post would link to another post in the pyramid. Through that process, building links for your money sites would look more natural. And we all know how much search engines love that type of link building strategy. With SEO, the more backlinks you have, the better. By using link pyramids, you’re backlinks are backed by more backlinks. One of the most useful- and definitely great- features of Link Pyramider is its easy-to-use content generator. Through this feature, you can easily and quickly build the fourth and/or third level of your link pyramids. You just enter in your keywords (to serve as anchor texts) and your target URLs. What’s great about it too is that you can add up to three links in one article. Whether or not all three links will be shown will be done in random (Doyle Lewis says this will help avoid ‘unnatural’ looking links). Remember though that it is best to use this feature only on Level 3 or 4 sites. Since Level 2 sites will be linking directly to your money site, it is best to keep them manually written and spun- to guarantee its quality. 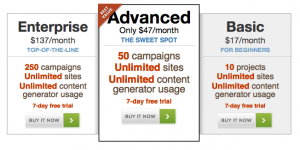 What’s more, there is a FREE account that will let its users run one campaign and use 50 sites. If you’re in the market for something to complement or improve your Senuke campaigns, Link Pyramider is worth looking into.